Integration was not the only step taken to make Episcopal a more diverse community. After the successful integration of the first fifteen African Americans, there was a tone of “building inclusiveness” on Episcopal’s campus (Brown Interview-EHSHP.org). In 1985, Episcopal hired their first African American teacher, Raymond Brown, a graduate from St. Albans and the University of Virginia. Then in 1986, Rodney Robinson created Spectrum a group designed to increase the strength and support of minority students on campus. 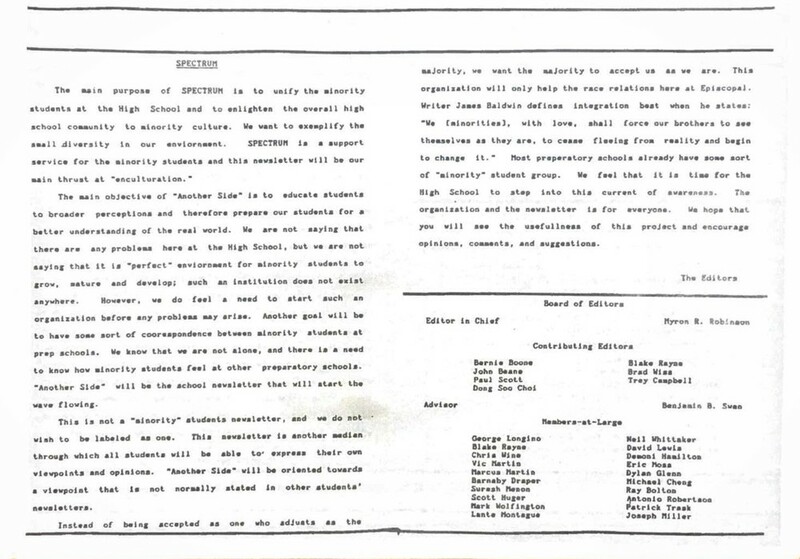 Finally, in 1991, EHS started coeducation, admitting 48 girls in the 9th through 11th grade. Over the span of 24 years, the school completely evolved and began to keep pace with social and cultural evolutions. Continuing with their plan of diversity, in 1985, Episcopal hired Raymond Brown as the first African American teacher at the on the holy hill. Mr. Brown taught history at Episcopal for two years before leaving the school and returning to his plan to run professionally. Mr. Brown arrived at Episcopal as a recent graduate and track All-American from the University of Virginia. As a St. Albans graduate, Mr. Brown was familiar with Episcopal, its culture, and some faculty, which made him the perfect candidate for hire to integrate the faculty. In Mr. Brown's words, his commonalities in experiences with the other faculty created a "welcoming atmosphere" and an overall positive experience (Brown Interview-EHSHP.org). After Mr. Brown, Allegra Burton was hired in 1987 as a part-time Spanish teacher. 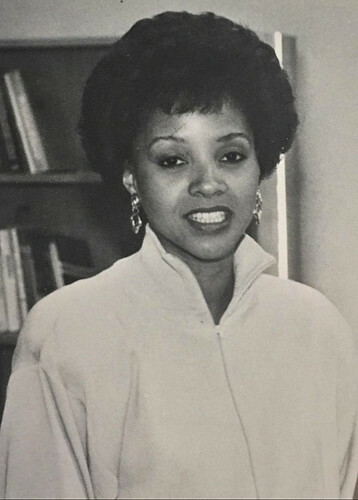 Before her time at EHS, Ms. Burton had taught male journalist in Madrid English for three years after college and worked on Capitol Hill for a congressman. This experience, along with teaching abroad, gave Ms. Burton a unique perspective to share with the boys she taught. During her time at Episcopal, Ms. Burton welcomed frank conversations with her students about race, gender, and economics, pushing the boys to view these topics from a different perspective than the one they grew up with. Listen below to Ms. Burton explaining how she defied her students understanding of race. Ms. Burton discusses how she defied her student's expectations of a black woman. For many "it presented the opportunity for the boys to have a broader experience in life" (Burton Interview- EHSHP.org). As a teacher, Ms. Burton was very open with her students and she pushed them to broaden their perspectives and break down their preconceptions of minorities. This is a yearbook club photo for Spectrum in 1993. Since the mid-1960's, Episcopal has been dedicated to a long term plan of inclusivity and acceptance. While not all Old Boys accepted Episcopal's steps to a more progressive social climate, by the 1980's there was a "tone in the air of building the inclusiveness of campus" (Brown Interview-EHSHP.org). This task of increasing diversity was taken up by a group of minority students. 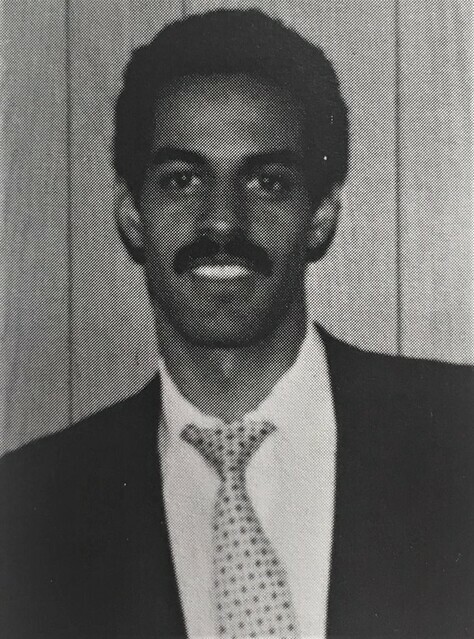 In 1986, Rodney Robinson formed Spectrum "to unify the minority students at the High School and to enlighten the overall high school community to minority culture" (Robinson Another Side). Spectrum was formed in the image of similar clubs at prep schools along the East Coast. Along with "exemplifying the small diversity" at Episcopal, members of Spectrum wished to hear and learn from the experiences of other minority students at different boarding schools (Robinson). Today, Spectrum still serves as a platform where "students can express their own viewpoints and opinions" and learn from the experiences of their classmates (Boone Another Side). Along with hosting meetings and discussions on campus, Spectrum also published a newsletter, "Another Side", to share different opinions on current events. In 1991, EHS began coeducation, admitting 48 girls in the 9th through 11th grade. 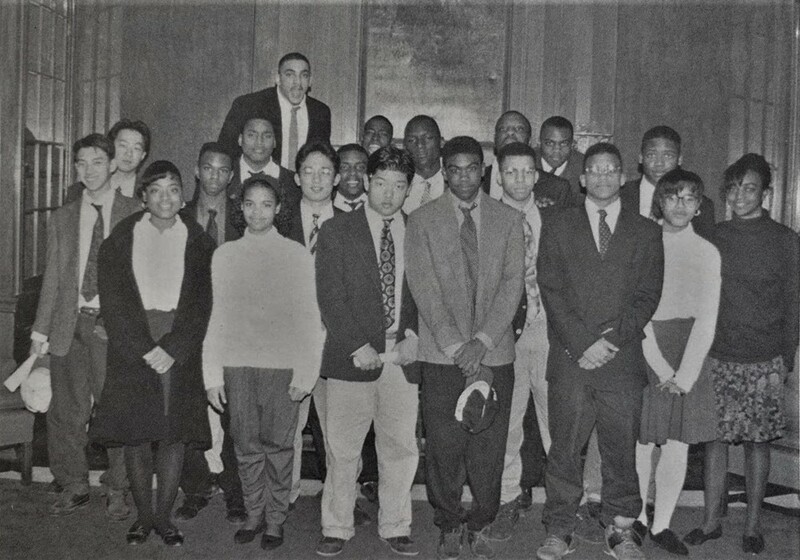 While this was 23 years after the school first integrated, the combination of race and gender created a very interesting dynamic. Throughout the country, biracial relationships continued to be taboo, and as an all boarding school, parents and alumni were very aware of the potential for relationships. Unlike their male counterparts, these girls had the pressure of not only establishing themselves as equals to their male classmates but also being a minority student.